Florida lottery winner Richard Lustig has won 7 grand lottery prizes. His lottery book details his simple secret system. OK, yes, Richard Lustig is a real person. But the first thing I should point out before the hype gets you, is that Richard is NOT a multi-millionaire lottery winner. He hasn’t actually won 7 huge lottery jackpots either. In reality his 7 wins amount to $1,047,060.58, and one of those prizes was a jackpot of $842,152.91. It’s also worth pointing out that his biggest win was back in January 2002, and his last ‘big’ win was way back in 2010. Bear in mind that lottery winnings are also taxed in the USA. So in terms of winnings received, he’s not even a lottery millionaire (as total winnings amount to less than a million after tax!). How much is Richard worth now? Who knows – he’s probably made more from selling systems than he ever won playing the lottery. There’s also a $5,145 win on the Florida Lotto on 11th July 2009, but I don’t think he’s counting that one as a ‘grand’ prize. OK, but that’s still more than most lottery players have won though, right? So is it way beyond luck as he claims? And forgetting the hype, is the advice actually any good? There is some basic common sense advice in the book (although a lot less than I give away for free in my lottery tips!). Advice such as keeping tickets that lose as a tax deductible and/or for playing those second chance drawings. Just don’t get too excited on the tax side as this doesn’t apply in most countries around the world (if they don’t tax your winnings, it’s extremely unlikely you can use your losing tickets to offset tax!). But the big problem is that key advice he’s offering in the book is just plain wrong. On two ‘strategies’ in particular. Richard advises always playing the same numbers every draw. He also advises buying scratch off tickets in batches of 10 of the same card rather than different cards. Both he claims improve your chances of winning – the fact is however, neither of those things make the slightest difference to your chances (they really don’t see below…)! This is the key piece of information he never lets on. Richard will simply not tell you how many tickets he bought to generate those 7 prizes – and therefore his real ‘profit’ (if any?). Remember, that big win (80% of his winnings) happened back in 2002. So although he may not like to think so, buying large numbers of tickets is the real reason he has won 7 times. That, together with choosing games which are easier to win in the first place, and a bunch of luck. Note that Jason Gershman, Ph.D (an Associate Professor and Coordinator of Mathematics at NSU) agrees with me on this point, and states that Richard’s advice is “nonsense” and that “you’d be wasting your time and money doing that system”. Since the original review of this book way back in 2011, Richard has teamed up with other marketers to promote various lottery products. These include ‘Lottery Winners University’ which was a video based rehash of his book that cost $50 per month. This also included an option to add-on or upgrade to include his software tools for a cost of $197. The ‘tools’ actually just turn out to be the nonsense previously sold as ‘Lotto Destroyer’ – but renamed as ‘Auto Lotto Processor’. He has also put his name to an e-book called ‘Lotto Dominator’. This is 180 pages of filler, repetition, confusion and nonsense at an absolutely ludicrous price of $147. Given Richard has still not been able to announce an 8th ‘grand prize’ win since 2010, I would strongly recommend avoiding all of these products too. According to a fairly reliable source Richard died on the 30 July 2018. Although he had health issues (heart problems) his death has of course still come as a bit of shock to many, and our condolences go out to his family. It looks like this will mean the end of ‘Lottery Winners University’ and ‘Lotto Dominator’ etc. Whilst not for the best reasons this is however not a bad thing as these products sadly have never offered anything worthwhile beyond minor entertainment value. Did you buy the book, join the ‘University’ or see him on TV? 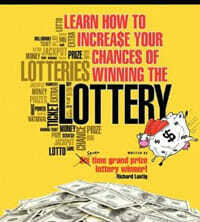 Let us know what you think of Richard Lustig’s lottery system book or advice by adding your comment or review below. Thanks. I get where you are coming from Sly – maybe this will help: The Big Question. What do you consider winning the lottery “numerous times”? 7, 8 9? In a 30 year period that is 9 out of 1,500 or so. If you play every time, you may well be losing money overall. Winning just about every time there is a drawing is impressive and constitutes a “system”. He sent me a flyer in the mail saying he would pick numbers for me and if they didn’t hit he’d send me back my money. I didn’t win a cent, sent it back to him and he kept my money, never sent it back. Don’t be stupid Sly, Richard has bought tons of tickets every week, every month of every year. There’s no method to what he does except he kept pouring his familys hard earn $ into the lottery for years and has never really been a big winner. The last win being 2010. It’s been proven he’s made more off of selling his nonsense advice. Good luck. Biggest nonsense I paid for in a long time… blah, blah, blah… Don’t spend a dollar on this book, it’s just not worth it. If you buy the book then he won the lotto again. Lucky man that’s all… the book is a piece of paper worth nothing. There are no secrets in this book whatsoever. I tried it fully. Doesn’t work. I spent $650, for a month, using his Auto Lotto Processor. Played all the games, followed advice he personally emailed me – after I asked questions. I LOST. Out of the $650 – I won $85. People, you need to understand that this Richard guy is just someone that is given a percentage of the profits from selling these products by a marketing group that uses clever sales tactics in the sales letter. I did catch something not right in the sales copy. He said he won a $1,100,000 something lottery, and bought with the winnings a house next to his friend that told him his secrets to win a lottery. They show a picture of the house he bought with the winnings and it sure looked like it cost at least $5 million and could in no way be purchased for winnings of a little over $1 million. That after taxes is actually substantially less than $1.1 million! It’s all a lot of b.s.! He claims he will send your money back if you don’t win. Luckily I didn’t send him much. If you get his BS in the mail, throw it away, it’s garbage and his guarantee is BS – he won’t send you a penny back. Does the book have numbers? No, it doesn’t have any information about number selection. Yeah I was just about to believe that crap as well. Just goes to show how gullible, easily led, dumb and emotional we are as human beings. But we just can’t really help ourselves. “HOW SAD”. That’s Life. Move on..? But we know how to pick up the peices and start again. A story of my life sssshhhoosh. I was one of those people who bought the system – well let’s just say it’s not worth it. Yes, it’s $147.00! So keep your money, it’s not worth it. All you get is more alerts to buy another system to pick numbers. That is $197.00! Oh, by the way, I haven’t won. Just lost my money. Don’t lose yours!